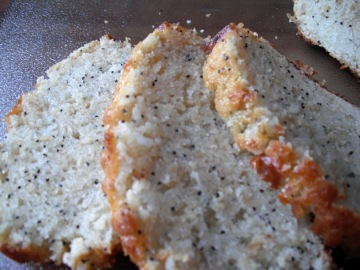 This lemon poppy seed bread recipe makes a loaf that is perfect for a casual special occasion breakfast or a simple dessert. It’s an easy quick bread recipe for two loaves. One for now and the other can be frozen for later. Tender and sweet, you don't need syrups or glazes with this recipe. Just bake and enjoy. Preheat oven to 350F/ 175C and grease two loaf pans. Use a large bowl and stir together the flour, oatmeal, salt, baking powder, sugar and if your using it powdered milk. Next add the eggs, vegetable oil, lemon and vanilla extract and water OR milk. Mix everything together. Pour batter into two greased and floured 8.5 X 4.5 inch bread pans. Bake for about 45-50 minutes then check, it might take up to one hour. The end result is quite moist so look for golden brown edges and a nice break on the top of loaf that is dry. Feel the tops, they should not be sticky, and a toothpick should come out dry even if it has crumbs. Take the breads out of the pans to cool on a baking rack. This recipe would also be great for muffins. Bake at 350 and check muffins in 20-25 minutes. Tip: Use a paper baking pan and save time. These pans can go in the freezer once the bread cools, plus you can give your loaves as gifts still in the pan. You don't have to grease and flour the pan first and you don't have to risk your loaf breaking when you try to take it out of the pan. There's nothing easier than that so go ahead, give them a try. Well, quick breads like this, by nature, are not the healthiest options, you can try different flours or more oatmeal slowly to your families taste. Try to leave out part of the sugar or substitute honey. You can also experiment with using purees. like apple sauce, to substitute for some of the oil. Wrap your cooled loaves in plastic food wrap. Then wrap in tin foil or place in a plastic freezer bag and remove the air. 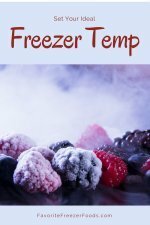 Label, date and add to your freezer inventory sheet. If you're using a paper baking pan than freeze it the same way. Leave wrapped bread on the counter for a few hours or thaw in the fridge overnight. 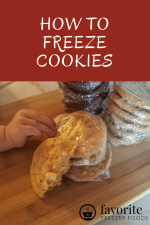 Learn more about freezing breads. Return from Lemon Poppy Seed Bread to the homepage of Favorite Freezer Foods.